Finding a flat, house or apartment to rent in New Zealand. Part of the gap year experience is not only working abroad but also renting an apartment! Finding some long-term accommodation while you are working for a while is when you know you have nailed it – you have bossed life in a foreign country! We’ll help you with the accommodation-finding process with this guide on how to rent an apartment in New Zealand. To make things simple, we’ll go through five steps to renting an apartment in New Zealand so you know what type of accommodation to look for, where to find apartments in New Zealand, what to do when viewing an apartment, what paperwork is involved, and finally, how to get along with your housemates and avoid disputes. Once you have all that you’ll be having a blast in the most cost-effective method of long-term accommodation in New Zealand. So let the flat-finding process begin! When it comes to looking at where to live for a few months in New Zealand, we really recommend find a place that you love, a job in that place, then start searching for accommodation. However, living somewhere inexpensive doesn’t hurt as a backpacker either. Check out the Top 10 Cheapest Places in New Zealand to Live in. We have heaps more accommodation guide in our City Accommodation Guide category. When renting an apartment in New Zealand, we recommend renting just a room or a bed (if you don’t mind sharing a room at a cheaper price) in an apartment rather than renting a whole apartment to yourself and/or finding your own flatmates. Renting a room for yourself means you are only responsible for yourself. 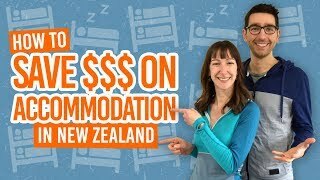 Considering most of us on a gap year in New Zealand only tend to need to find a room to rent for only a few months of the year, why deal with the stress of finding other flatmates? Therefore, the first thing you need to do is search for the terms “room for rent”, “room to rent” or “flatmates wanted” when looking for this type of long-term accommodation in New Zealand. There are a few different resources you can use to find yourself an apartment to live in New Zealand, from online to in the supermarkets. Use a combination of them to increase your chances in finding accommodation fast! For more information on these, check out 6 Resources to Find a Room to Rent in New Zealand. It should go without saying, but go to view the apartment before agreeing to move in! This way you can get more information out of your landlord/flatmates about the room and see if it’s a place you can actually see yourself living in for the next few months. However, still remember that it is only a few months – you’re not looking for your dream home here – so having an open mind will help you find a room faster and maybe even save some money. What is the cost of the rent, power bill and bond? What is the move-in date? You can get more information on what to look for when viewing an apartment in Find a Flat in New Zealand and here are some tips on things to look out for in Safety Tips Before Moving into a Flat or House in New Zealand. Once you’ve found yourself a place to live in New Zealand, it’s time to fill out some necessary paperwork. By filling up the right paperwork, you will be covered by certain laws in New Zealand should anything go wrong between you and your landlord. (Find out more about that in What Are Your Rights as a Tenant or Flatmate in New Zealand). Filling out paperwork also reduces misunderstandings so you know exactly what your tenancy entails. Find out more about these forms in The Paperwork Process of Renting or Flatting in New Zealand. Should you have any serious disputes between your flatmates and/or landlord, read What Are Your Rights as a Tenant or Flatmate in New Zealand for advice.